A high-power L-band microwave source has been developed using a metamaterial (MTM) to produce a biperiodic double negative slow wave structure (SWS) for interaction with an electron beam. The beam is generated by a ~700 kV, ~6 kA short pulse (~ 10 ns) electron beam accelerator. The design of the metamaterial SWS (MSWS) consists of a cylindrical waveguide, loaded with alternating split-rings that are linearly arrayed axially down the waveguide. The beam is guided down the center of the rings by a strong axial magnetic field. The electrons interact with the MSWS producing electromagnetic radiation in the form of high-power microwaves (HPM). The Power is extracted axially by a conical horn antenna. Microwave generation is characterized by an external cutoff waveguide detector, as well as the radiation pattern of the RF. Mode characterization is performed using a neon bulb array, where the bulbs are lit by the electric field in such a way that the pattern in which they are excited resembles the field pattern. A time integrated image is of this pattern is taken by an SLR camera. Since the MTM structure has electrically small features, breakdown within the device is a concern. 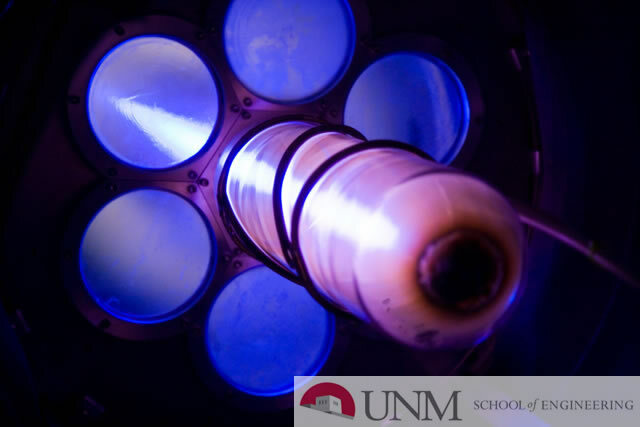 Therefore, a fiber-optic-fed, sub-ns photomultiplier tube array diagnostic has been developed and used to characterize light emission from breakdown. A description of the diagnostic developed and experimental results will be presented.